If you’ve experienced a pregnancy loss, you know that it can be one of the most devastating times in your life. It can feel like a storm just ripped through and left you helpless in the wreckage. When you have a healthy pregnancy after an experience like this, it’s much like a rainbow after a horrible storm. The beauty of a rainbow will not fix the damage caused by the storm but it’s a sign that the storm has passed. 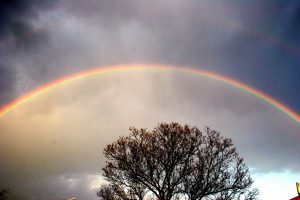 You can enjoy the beauty of the rainbow without forgetting about the pain of the storm. Without the storm you wouldn’t have the rainbow so if another storm comes just push through until you get to that rainbow.